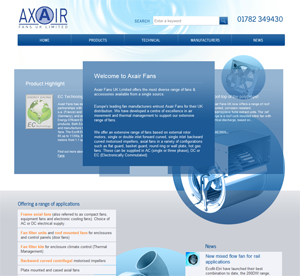 A brand new website, designed and built by Rapid Web Services, has just gone live for our client Axair. The site has been completely redesigned as the existing site was out-dated and was not well optimised for search engines. The new design has brought a fresh look, while remaining within the brand’s visual guidelines. All code has been written with search engines in mind, and all products from the existing site have been placed into a database for ease of management. A blog has been integrated into the website, with all existing news items from the previous site moved across to immediately populate this area. Axair will have access to this area of the site to add new blog entries, helping to keep the website fresh and up-to-date.